Rob Spence replaced his right eyeball with a digital video camera equipped with a tiny transmitter. As a child, he injured his eye in a shooting accident. 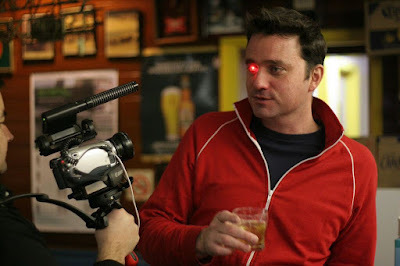 The camera is not connected to Spence’s brain and therefore does not replace the “sight” of his right eye (these devices are under development). The "Eyeborg" records and transmits 3-minutes of video - the time limitation is a consequence of heat build-up. In Dave Eggers novel, "The Circle," a "Big Brother-like" social networking and dominant Internet company (Facebook, Google?) develops sophisticated 24-hour monitoring technologies in the form of light, wearable cameras that provide real-time 24-hour video and audio. Eventually, these cameras are placed throughout public and private spaces and households. In the book, memes include: "What are you hiding? ", "Secrets are Lies," "Sharing is Caring, and "Privacy is theft." Note that Microsoft's Research Labs have created "SenseCam" a "life-logging" wearable camera that takes photos automatically. Originally conceived as a personal ‘Black Box’ accident recorder, it soon became evident that looking through images previously recorded tends to elicit "quite vivid remembering" of the original event. SenseCam: "This exciting effect has formed the basis of a great deal of research around the world using SenseCam and the device is now available to buy as the Vicon Revue." "The Singularity" is a term popularized by Ray Kurzweil, inventor and futurist, now with Google, along with computer scientist, and science fiction author, Vernor Vinge. It refers to the convergence of artificial intelligence (A.I. ), human-computer interface (HCI), and biological enhancements wherein the border between human and artificial blurs to irrelevance. Eyeborg was created by “Ocularist” Phil Bowen, who designed a two-part eye shell to house the components, Kosta Gammatis, an engineer who designed the camera, on Spence’s kitchen table, RF-Links, the company which created the micro radio-frequency transmitter, and Martin Ling, who assembled the working device.